Please scroll down to take note of the variety available. You are our Creator and our Sustainer. You are our Light and our Fortress. You are our Wisdom and our Strength. We ask for your guiding hand to lead us through this meeting. May we approach our tasks with wisdom, and may we approach our members with respect. May our conduct create an environment of cooperation and kindness. Thank you for helping us to accomplish our work this day. We come before you today to honor you as our Creator and our Healer. We gather today to thank you for this beautiful new medical facility. We ask that you would put your hand of blessing on this building, and on all the medical equipment, and on all the men and women who will be working here to bring your healing to the sick and injured. We especially ask that you would pour out your healing mercies on those who will come here in need of help. Lord, we pray that this place would not only be a place of healing, but also a place of kindness and compassion. May your heavenly peace be felt in this building. We come today to honor you - and to remind ourselves of your pivotal place in our lives. We ask for your blessings on this meeting. We ask that your wisdom would guide us as we seek to accomplish the goals on today’s agenda. Thank you for the opportunities you give us to serve you and to serve others. May our actions and our attitudes please you this day. We come today to bow our heads and open this meeting in prayer. We ask that you would bless our speaker (speakers) and that you would bless our time together today. May we grasp those things that you want us to understand. May our hearts always be ready to respond to you and your wisdom. We give you praise and honor as we begin these festivities. We gather today to celebrate this historic event. We are thankful to you and to all those who have worked so hard to put this event together. We ask that this day be a day of reflection and refreshment. May we remember the deeper meanings of this day as we share enjoyable fellowship with one another. We come today to spend time in your Word. Bless this time together. Guide our thoughts and cleanse our hearts. In Ephesians 5:26, you tell us that you wash us with the water of the Word of God. Thank you that as we study your Word today you will - Wash Us with your Word. Thank you that you will wash us, cleanse us, refresh us, and redirect us - with your Word. Thank you for our Sunday school teacher and for our pastor, and for our church. Lord, we are here with an open heart wanting to learn more about you. We come to you today asking you to help us gain the steadfastness, the strength, and the determination that we need to follow you closely every day. 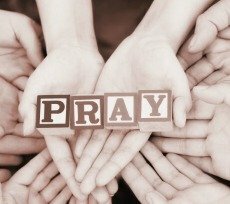 This page has opening prayers for meetings and opening prayers for ceremonies and two opening prayers for a Sunday school class.